An Adventure in Mirrorless Living—Could You Do It? We’ve all heard of abandoning your scale—for the sake of sanity, to break a habit of vanity, for a healthier outlook—but Kjerstin Gruys is taking that one (million) step(s) farther by giving up mirrors. 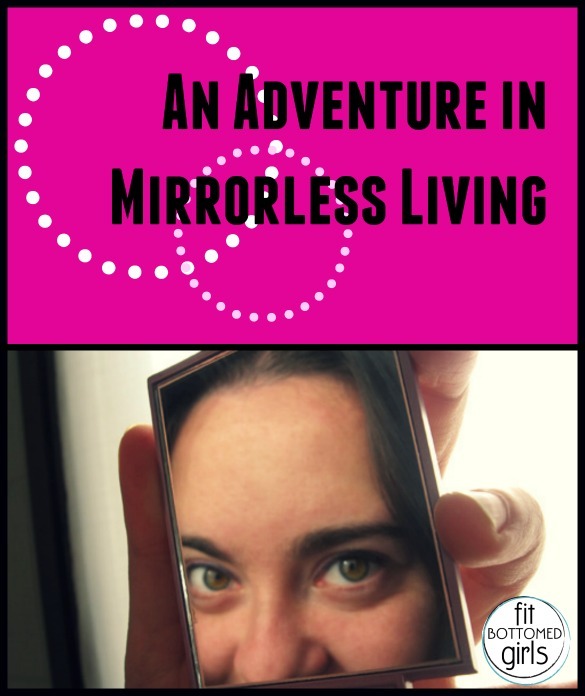 Kjerstin is a 20-something sociologist and PhD student who studies “the relationship between ‘beauty’ and inequality.” She has vowed to go without mirrors for one year (or until it drives her crazy!). That’s insane, right? Well, let’s add this—she got married early this fall. Without. ANY. Mirrors. Not even a picture. (Well, one, but she had someone else choose it, and she didn’t see it until after the wedding)! I would die. But those are the rules. Yes, Kjerstin follows a set of official rules that were established at the start of her reflection-less journey and has even upped the ante a couple times with no photo and no makeup addendums. This girl is amazingly dedicated. And that dedication has earned her amazing results—not just for her project but for herself. Of course, like everyone, she still wavers. While poolside on her honeymoon, she looked down at her bikini-clad self and liked what she saw. She snapped a photo with her phone—as much to remember the feeling as the image. But then she realized that, somehow, the camera had made that smooth, svelte image appear “lumpy and out of proportion.” She posted it anyway. Amazing, told ya. When I first heard about the task that Kjerstin had set for herself, I poked around her blog, just scanning posts and rules. I don’t consider myself a very vain person, but, if it tells you anything about me, the title that jumped off the screen the most was Abandon Control. Yeah, no, I’m not so good at that! But I love this experiment, even if I don’t think I could fully execute it. But what about introducing this way of thinking into my bad-photo-deleting lifestyle? Kjerstin mentioned to me that she’s not (yet) a mom, but I can say that being a mom and working from home has definitely lessened my compulsion to get dressed up and made up. But I mean that in the best of ways; I’ve noticed that the circles under my eyes (kind of!) camouflage themselves if I leave them alone, that my hair looks better after a day of wear (dirt, whatever), and that I often actually look better in “at-home” clothes than work clothes anyway. Of course that doesn’t mean that 1) I use those things as an excuse to not get dressed or care for myself at all, or that 2) I don’t fall subject to my old self-critical habits when I do venture out. I think I’d last one day without mirrors. Perhaps a weekend if I wasn’t going anywhere. Two-hundred-plus days into this 365 day experiment, Kjerstin has not looked back. There is much, much more to her story (spoiler: her Mirror vs Scale posts discuss how she’s simultaneously a recovered anorexic, a feminist and on a diet—and how majorly those things conflict with each other). You NEED to read more. Kelly Perotti is the author of Crib Notes, a candid look at conception, pregnancy and parenthood. She gained her insight and expertise during a nine-month course called Pregnancy and continues on-the-job-training mothering two boys just 18 months apart in age. Her juggling act of kids, self, marriage and work is chronicled at www.CribNotesKelly.com. Comments and communications are welcomed on Facebook and Twitter @CribNotesKelly or at CribNotesBook@gmail.com.